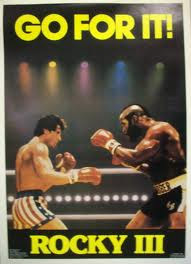 Sylvester Stallone as Rocky has a Muscular Body sculpted into slabs of muscle and extremely low body fat, the best shape he was ever in during the entire movie franchise history.Here Sly portraits the American hero boxing champion in the famous scene from the end of Rocky-4. 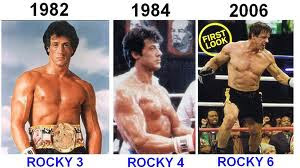 Sylvester Stallone muscles and rock body makes for a successful career including 6 total Rocky's, 4 Rambo films, Cliff Hanger, Demolition Man, The Expendables, Cobra, Tango & Cash, The Specialist, Judge Dredd, Copland,Get Carter, and many more.His physical body has progressively grown more impressive with each movie roll and now into his mid 60's Stallone is still in fantastic shape and continues to push himself to the very limits of human potential. 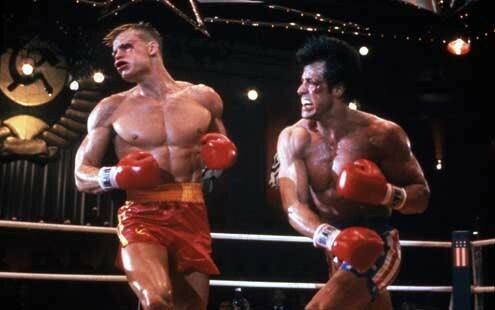 Rocky 4 vs Ivan Drago, training and end of fight video. 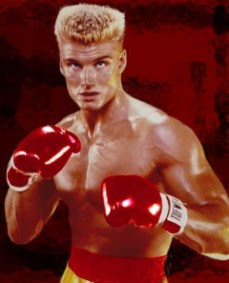 The muscles of Dolph Lundgren "Ivan Drago" the Russian Body of Muscular development, Sylvester Stallone's workout partner for Rocky 4 has some excellent chest development for punching power! 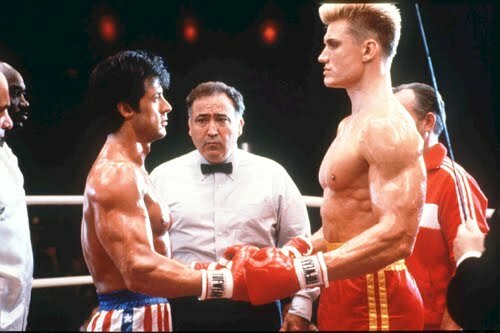 here Dolph Lundgren's muscled up body dwarfs Sylvester Stallone in sheer size, body weight, height, and muscular development, clearly some heavy hitting Hollywood muscle. 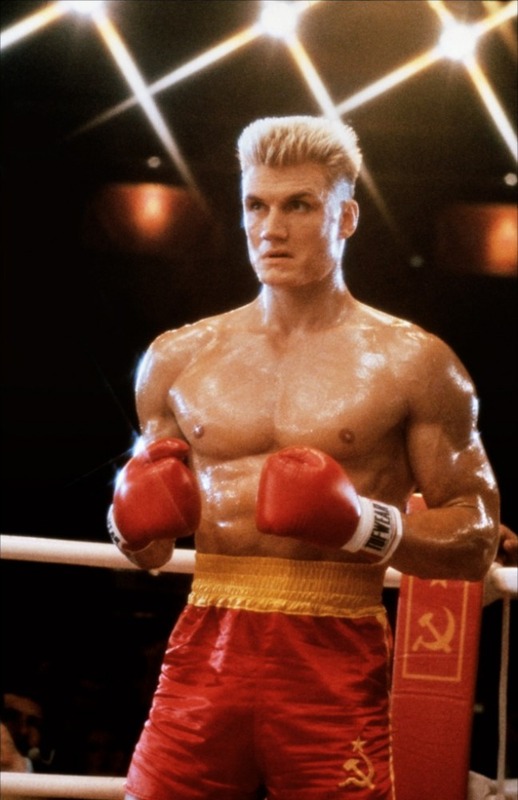 Ivan Drago is freakin huge. 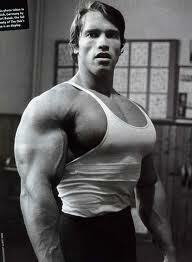 Probably the most developed Chest in Hollywood at the time, 2nd only to Arnold "Conan" of course. 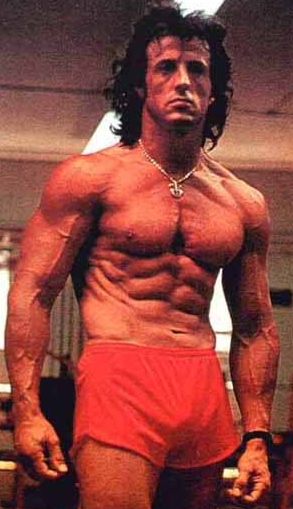 This Chest workout program included : flat, incline, decline bench press, dumbell flyes, dips, cable crossovers. 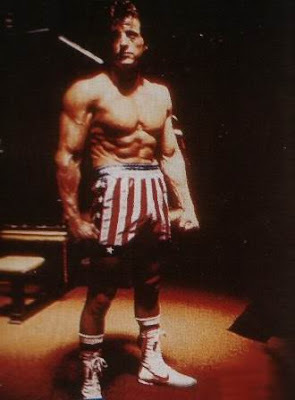 Rocky using a primitive form of the Military press for overall shoulder development. Training old school style in a Russian barn during the winter. 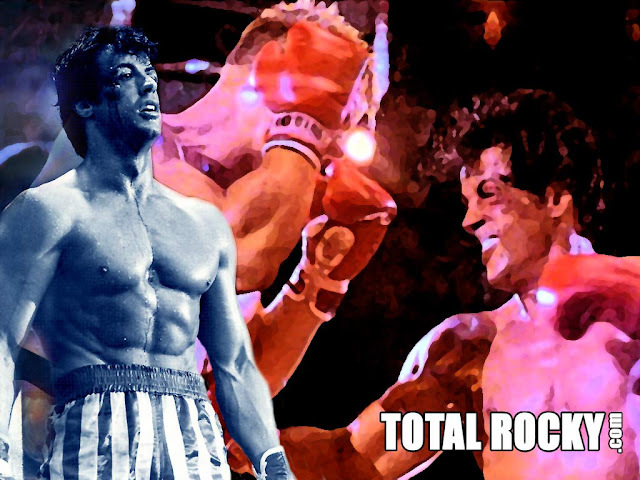 Chopping wood , running in deep snow, and using makeshift weight resistance devices Rocky gets into the shape of his life pushing his body to the limit. 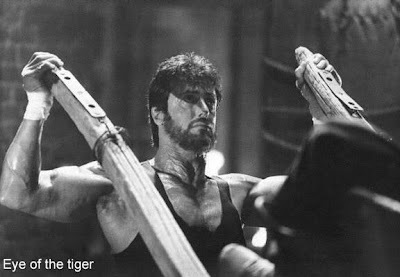 Clearly Sylvester Stallone's body shows good use of strict form barbell curls, Incline dumbell curls, for biceps, Pushdowns for triceps, Pull ups, chin ups, seated lat rows, pull downs for superior back and intercostal development. Not to mention a strict clean high protein diet nutrition plan. 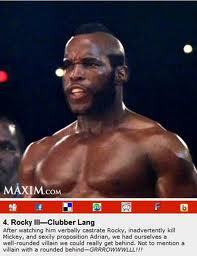 I takes strong will, determination and drive to achieve this level of fitness. 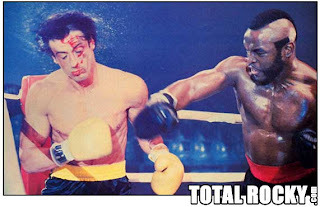 Stallone has what it takes and keeps on pushing his limits. 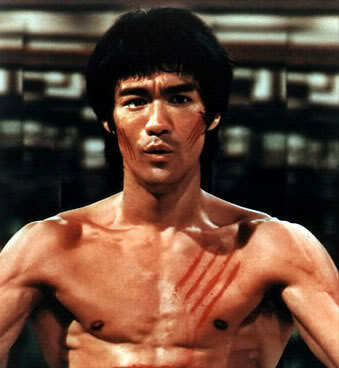 The tenacity of his characters portrayed in most of his movies comes from his own person. 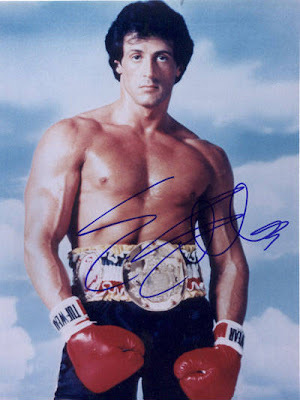 Stallone's own life was filled with trials of hardship such as poverty, that he was able to overcome. 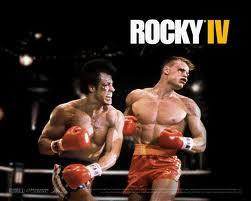 Writing the script for Rocky was inspired from actual boxing matches he watched. Getting that script to the big screen almost never happened . 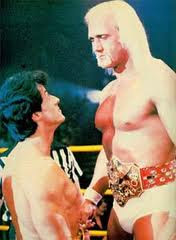 Stallone had shown the script to literally hundreds of potential producers in the NY area. 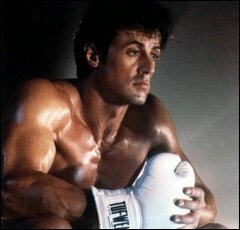 After multiple rejections Sly kept at it, finally a movie producer got so tired of him coming into his office he decided to have a look at the script, he liked it and offered to buy just the script for $125,000 later he was offered even more $325,000 but to star Robert Redford for the lead role. 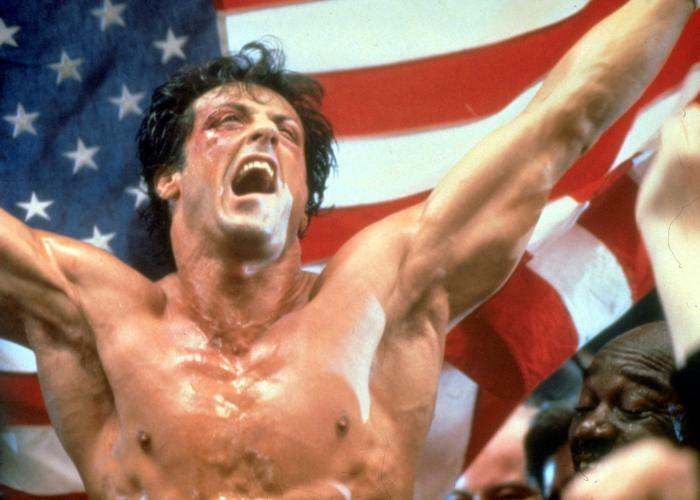 Stallone was broke and living in a tiny NY apt, with no money or furniture he rejected the offer because he knew he would be destined to play the lead role as "Rocky" . It got so bad for Stallone that he ended up selling his best friend "Butkis" his dog in front of a liquor store. 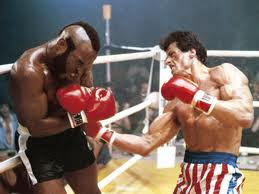 Later the Movie producer wanted the script so bad he finally offered Sly a measly $30,000 and the lead role in the film. and the rest is History....he tracked down the man who had bought his dog and offered to buy him back. The owner refused, Sly persisted and increased the offer from $500 to a $1000 ,$2000 $3000 the owner kept refusing and wondered how Sly had that much money, Sly told him he just sold his movie script, and the owner finally settled for $15,000 !!!! This is the same dog that is in the original movie Rocky 1.... which went on to make over $200,000,000 and launched a billion dollar career! 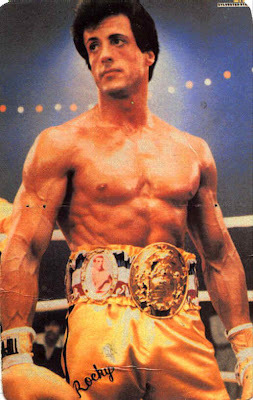 Considerable attention to detail was obviously taken by Sylvester Stallone in getting into this incredible muscular condition for his all time best shape during Rocky 4. 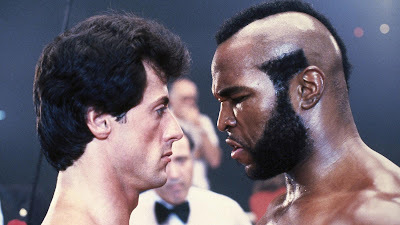 Sylvester Stallone and Mr T square off as Rocky 3 is just getting warmed up. 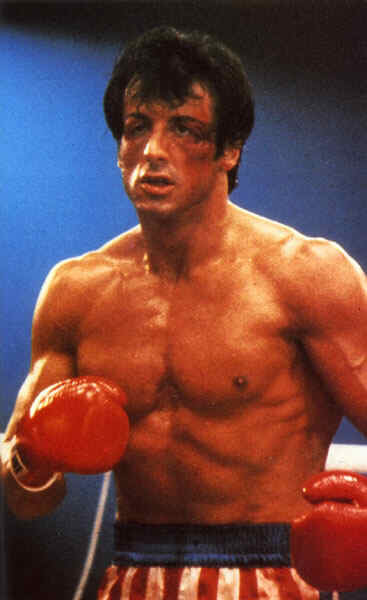 May we all have comebacks in life just like Sylvester as Rocky.